Trails are at the heart of all our activities. Most of our volunteer hours are spent maintaining trails - repairing, brushing, rerouting and so on. But mostly brushing - everything grows fast here, and unmaintained trails will simply disappear within as little as two years. 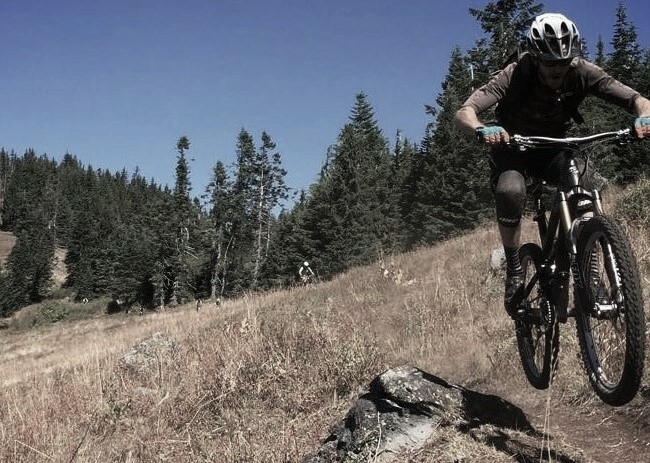 We work in close cooperation with the Middle Fork district of the Willamette National Forest, since all our trails are on their land, and we consider them to be our "boss" when it comes to planning and implementing trails projects. Though the Forest Service is the ultimate arbiter of new trail development, we work with them to push forward the implementation of the Oakridge-Westfir Community Trails Plan (PDF). The plan prioritizes the development of a rich and varied experience for all trail users, with an emphasis on connections to the community, trail connectivity generally, and filling in the gaps in our trails inventory (e.g. more beginner level trails, of which the canal trail is a great example). For information on current trail conditions in the Oakridge area, check with the local bikeshop, Willamette Mountain Mercantile. If you have an update on a forest road or trail condition, you may contact the Middle Fork Ranger District at 541-782-2283 or e-mail. Please include the location and specific concern such as washout or diameter of the down log.